What should you know about the Jehovah's Witnesses who come to your door? If you are a Christian or just interested in knowing the beliefs of this religious group, the 10 Questions & Answers on Jehovah's Witnesses pamphlet will help. 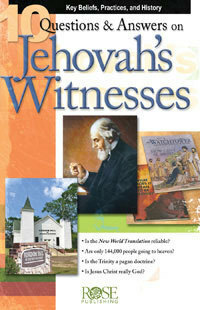 It compares Christian beliefs and Watchtower teachings on 10 of the most important questions regarding Jehovah's Witnesses, including information on how the Jehovah's Witnesses began, the prophecies made by their leader, Charles Taze Russell, the number of people who will go to heaven, and the reliability of the Watchtower's New World Translation, and much more. Full color and glossy, the pamphlet explains the key beliefs, practices, and history of this group and how their teachings contradict biblical Christianity.